You will likely admire their beauty, but when it comes to knowing what to do with them, quite possibly, you might be stumped. Because they are likely as unfamiliar to you as they were to me when I started eating locally grown farm fresh food. I wasn’t sure I’d ever had leeks, and I definitely knew that I never had cooked with them! 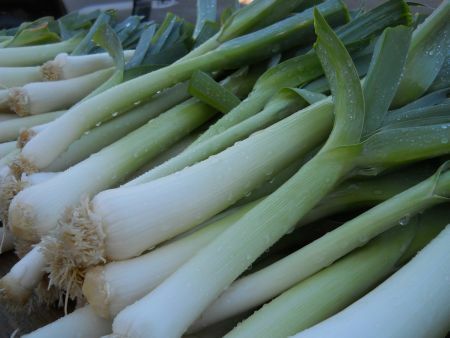 Leeks are part of the onion family, but there the similarity ends. Their flavor is anything but assertive. Leeks are subtle and refined with a seductively nutty flavor. Their texture is something a little different as well. And their aroma when cooking! Yum! I’m not going to beat around the bush. Leeks are dirty. If you’ve ever seen them growing in the ground you’ll know why. They have many layers that fan out at the top and can collect dirt that can lodge between the layers. So the biggest trick to loving your leeks is to clean them well to remove the grit before eating. Remove the root end and the dark green fan tops. The white and light green parts are what you want. You can use the tops for making homemade vegetable broth. Here’s my tutorial on how make your own broth using scraps. Slice your prepared leek in half lengthwise. Hold under cold running water to rinse between the layers. There! You’re ready to proceed with a recipe! A good question and one we get from lots of new CSA members. I’ve put together a great list of a few of my favorite ways to use leeks (besides above mentioned quintessential soup) and a couple great new ways that I just tried this week! Maybe you’ll find your new way to loving leeks here! So, you all probably have heard of Potato Leek Soup! But, did you know that you can put leeks into just about any kind of soup?! Substitute for onions or throw them in in addition! You can make a frittata out of just about anything! And leeks are no exception. In fact you could make the Melted Leeks recipe below and put that into a frittata alone and it would be delicious! Here's my basic tutorial on making a frittata out of any veggie. Heat your cooking oil on medium in a cast iron skillet or other oven safe skillet. Add leeks and saute gently, stirring until tender, but not browning. Add prepared Brussels sprouts and optional garlic and saute until heated through. Meanwhile, mix eggs, milk, cheese, salt and pepper in a bowl. Pour over leek and Brussels sprouts saute. Cook on medium until the edges begin to set, about 5-10. Cook in the oven at 400 until middle is set, about 15-20 minutes. #3. Use Leeks On Pizza... or just about anything else! I said "on pizza" above, but what does melted leeks not go with?? Try it on a pasta salad, mac and cheese, to top fish, with mashed potatoes, or on eggs with a little goat cheese on top. Mmmm! Heat oil and butter on medium in a heavy bottomed skillet. Add leeks and stir to coat in oil. Reduce heat to medium-low and cover. Cook, stirring occasionally, for 30-45 minutes until very tender (no firmness or chewiness should be remaning). Add more oil if need be to keep things from getting too dry. Leeks work well in combo with or replacing onions in any kind of savory casserole including Shepard's Pie, pasta bakes, and this twist on the classic Potato and Leek flavor pairing. Preheat oven to 400 degrees. Butter shallow baking dish. Layer potato slices in bottom. Cover with approximately half the leeks, half the cheese, half the flour, salt and pepper to taste, and a couple pats of butter. Repeat with another layer of the same. Top with the remaining sliced potatoes and breadcrumbs. Pour in milk to about half way up the dish. Add additional pats of butter to the top, as desired. Bake at 400 until potatoes are cooked and casserole is set, approximately 45 minutes to 1 hour. Whether you use leeks in place of onions or in addition to onions, they go very well in basic sautes or stir-fries with whatever you have on hand. Here’s a recent version that I just made, but feel free to play around with what the featured veggies are in it. Heat butter on medium in skillet. Add turnips and leeks and sauté stirring until just tender, about 10 minutes. Make sure to not brown the leeks, so turn the temperature down to medium low if need be and/or add a little more butter. Mix the miso paste into the hot water until dissolved and with the rice wine add to the turnips. Stir to coat and to cook off any unnecessary liquid. Add salt and pepper to taste. Serve hot. Put prepared Brussels sprouts, leeks, and garlic on a baking sheet. Season with salt and pepper. Drizzle olive oil, vinegar, and honey on top. Mix thoroughly using your hands. Roast in 375 degree oven until tender, about 25 minutes, stirring occasionally to ensure even roasting. Are you already a leek lover? If so, what is YOUR favorite way to use leeks? Hit reply and let me know!